Africa that still prides in wildlife concentration. Masai Mara National Reserve is located in the South-western of Kenya, 290km from Nairobi. The abundance of wildlife and the remoteness of the reserve implant memories that no money can buy. The annual wildebeest migration is a clockwise fashion spectacle for about 1,800 miles from the open Serengeti plains in Tanzania to the Masai Mara National Reserve in search of green pastures and water. 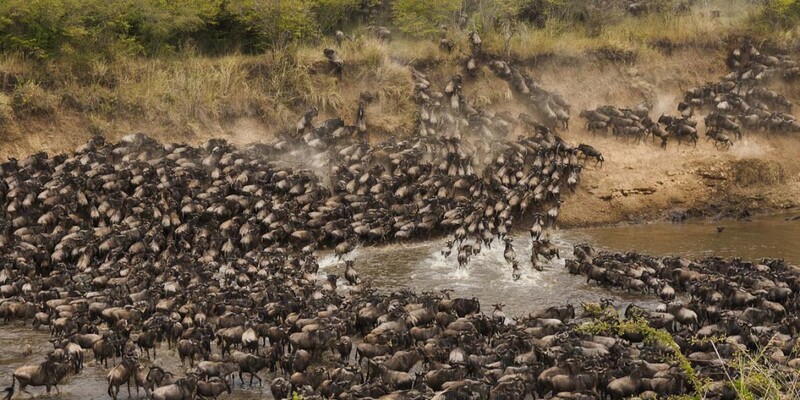 The wildebeest migration offers one of the best events in terms of wildlife tourism calendar in the whole world. Between January and March is the time when about 500,000 calves are born in a six week period each year in the eastern Serengeti. During this time, there is plenty of rain ripened grass and water to drink. The herds leave the Western Corridor for the northern Serengeti plains and woodlands moving targeting the fresh, tender and mineral-rich pastures in Masai Mara, an event which usually starts in late June to early July. The troops coming from the south meet here another migratory contingent: the resident wildebeest herds of the Mara region. These animals reside in the Loita Plains and Hills, northeast of the Mara until the dry season brings the tougher days and it is time to seek the evergreen Mara basin. July is the most active month. The thousands of herds cross the Sand River, a mostly dry tributary of the Mara which roughly follows the boundary line between Kenya and Tanzania. The procession continues eastwards of Masai Mara, occupying temporarily the Keekorok area. The trek follows westward, leading the herds to face the major challenge along with their quest: crossing the Mara River and frequently also its tributary, Talek. Between July and October, the herds of thousands of zebras, antelopes and other wildebeest migrate to the Masai Mara in Kenya in search of the fresh grass. The Masai Mara wildebeest migration journey to the Masai Mara is too long that leaving the old and weak animals to die due to exhaustion, starvation, and thirst. More wildebeest die when crossing the Mara River where the giant African Nile crocodiles dangerously attack them as the predators feed on the dead drowned animals. (Sometimes the overwhelming number of these animals jumping into the water all at once scares even the huge crocodiles.) However, this hardly affects the wildebeest population since there are about 400,000-500,000 new calves each year. Many calves die as they re-cross the river several times searching for their mothers. Over 2 million wildebeest graze on the Savannah grassland of the Masai Mara destination until November when the short rains begin in the Serengeti. They begin their journey crossing the Mara River again and when they arrive in the eastern Serengeti in February, the migration cycle is completed and calving for the next migration begins.